So, I decided to ride my bike up near the base of Cogswell Dam yesterday, just to scout out conditions. As you can see from this YouTube link, the West Fork is as challenging as it is beautiful! The late morning started out with hazy sun, and by the time I started fishing at 10:30, it was cloudy and cool. I didn’t see any major hatch, though at some places there were plenty of black gnats that were fascinated with my sunglasses. The water upstream seemed slightly cloudy, and the riverbed is still dark (and slippery! )from last fall’s leaf liter, so it is nearly impossible to see the dark shadows of fish amid all the protective structure. but I’ve been told that when nothing else seems to be happening, try a woolly bugger. This approach was immediately rewarded with four-five flashes, each probably between 5-to-8 inches long. I don’t have any significant experience stripping WBs, so it took me awhile to get the hang of it, but eventually this 6-inch rainbow totally gulped the WB. anything after that, despite drifting multiple flies and midges. 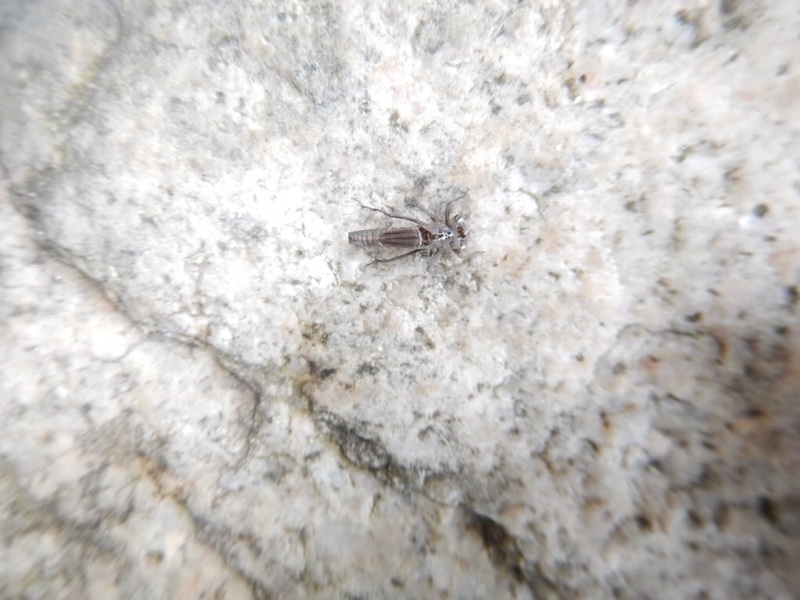 There were stoneflies, ants and other terrestrials out in force, but the fish remained hunkered down, and I don’t know if it was due to the low pressure of the impending storm, or the lack of a hatch, or just my own technique. You have to bring your best game to the West Fork. I think it’s good that we’ll each spend a concentrated effort on individual segments of the river: It will give us a chance to see what works best for any given riffle or pool. And, in any case, it will be a beautiful day. 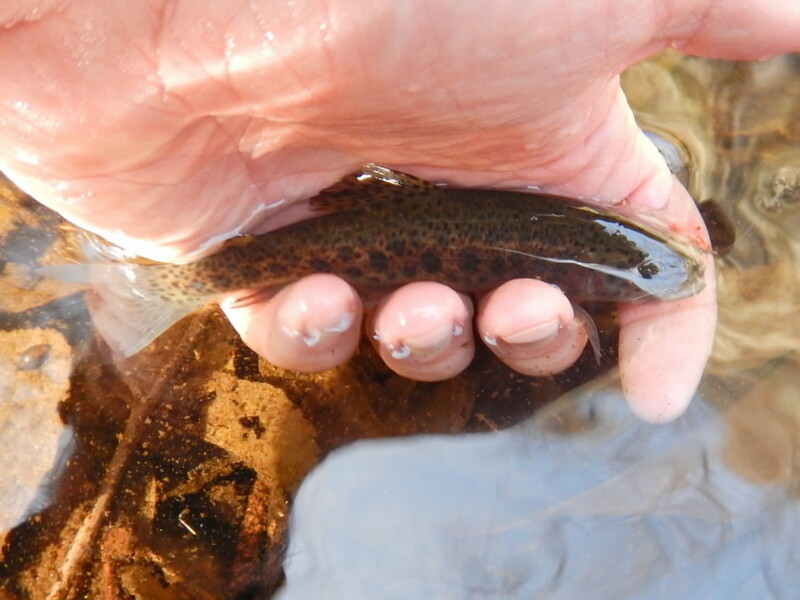 Wonderful news that the trout are back on the West Fork. 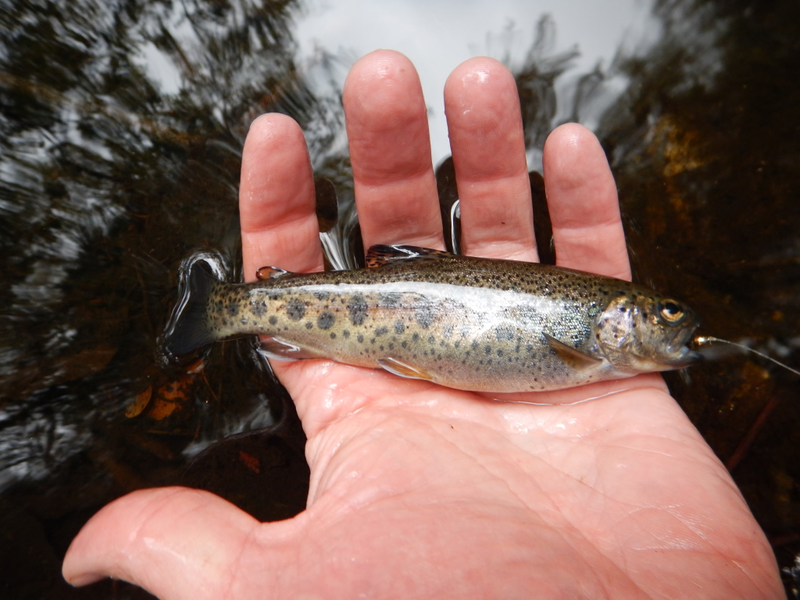 It’s one of the last remaining hopes for catching trout on a fly in LA County. I quite agree, Luis. This is our best chance for fly fishing here in So Cal. I so hope that after the yellow-legged frog, Station Fire, prolonged drought, poachers in the c/r section, the area will make a strong comeback.